Raith Rovers have reported losses of almost 400,000 for the year to June 30, 2018. Raith Rovers lost nearly £400,000 during last season's failed promotion bid, the club has announced. The annual accounts for the year ended June 30, 2018 show a substantial loss of £393,220 following the decision to remain full-time in League One. In a statement posted on the club's official website last Friday - but not shared on any of its social media channels - the board blamed the figures on the "significant impact" of relegation from the Championship the previous season. The statement read: "Comparing to the prior year, costs were dramatically reduced by nearly £400,000, however income fell by almost £600,000 mainly from reduced gate income, commercial income and SFA/SPFL contributions." 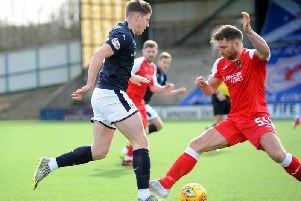 The shortfall was mostly funded in the shape of loans from Stark's Park Properties, the separate company which operates the stadium, but which is also owned by the football club's majority shareholder, John Sim. In total the club has accrued debts of £590,000 over the past two years, mostly owed to Stark's Park Properties. "These operating losses are not sustainable, and the current football club board are focused on placing Raith Rovers FC on a sound financial footing, whilst still retaining our footballing ambitions," the statement added. "The financial pressures of League One continue this season, particularly related to monthly cash flow, however the board are projecting improved financial results for this full financial year helped by strong cost controls and by the recent Scottish Cup run." The club are believed to be exploring all options for next season - including some element of part-time football in the event of another failure to gain promotion - but for now the focus remains on returning to the Championship next season, most likely via the play-offs as Arbroath run away with the title. "We are now into the last quarter of the season and whilst not in the position we would like to be, still have the opportunity to gain promotion which was our aim from the outset," the statement continued. "Everyone at Stark’s Park is committed to doing the best for our football club and your continued backing on and off the field is hugely important. "The Board of Directors of Raith Rovers FC would like to thank all of our fans, shareholders, staff, volunteers, sponsors and partners for their ongoing support. "Shareholders of Raith Rovers Football Club Ltd will be invited to an AGM in due course, as will shareholders in New Raith Rovers Ltd and Raith Rovers Holdings Ltd."